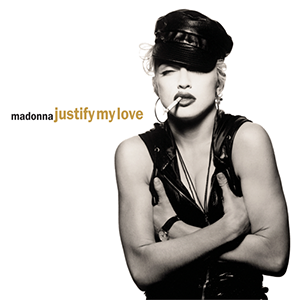 "Justify My Love" is a song by American recording artist Madonna from her first compilation The Immaculate Collection (1990). It was released on November 6, 1990 by Sire Records, as the first single. The song later appeared on the greatest hits compilation album Celebration (2009). The song was written by Lenny Kravitz and Ingrid Chavez, with additional lyrics by Madonna. Chavez was not credited on the song, which led to a lawsuit against Kravitz. Chavez settled out-of-court, the terms of which included a songwriting credit. Madonna's vocals are primarily spoken and whispered, but almost never sung, a style which she again employed on her following album Erotica (1992). Justify My Love was the first VHS video single to be released by American singer Madonna. This was the first time an artist had released a single in this format. It was released by Warner Music Vision, Warner Reprise Video and Sire to capitalize on the controversy surrounding the music video to "Justify My Love", which was subsequently banned by MTV. It contained the highly controversial and sexually charged video. The Immaculate Collection is the first greatest hits album by American singer-songwriter Madonna. It was released on November 9, 1990, by Sire Records and Warner Bros. Records. It contains new remixes of fifteen of her hit singles from 1983 to 1990, as well as two new tracks, "Justify My Love" and "Rescue Me". The title of the album is a loose pun of the Immaculate Conception, the conception of the Virgin Mary without any stain of the original sin. This name follows Madonna's religious-themed songs and videos, as well as the second section of her Blond Ambition World Tour, which also employed religious motifs. An extended play titled The Holiday Collection was issued in Europe to accompany the compilation and the re-release of the single "Holiday". It is the first album ever to use an audio technology called QSound. Madonna Louise Ciccone (born August 16, 1958) is an American singer-songwriter, actress, author, director, entrepreneur and philanthropist. Madonna is known for continuously reinventing both her music and image, and for retaining a standard of autonomy within the recording industry. She attained immense popularity by pushing the boundaries of lyrical content in mainstream popular music and imagery in her music videos, which became a fixture on MTV. Critics have praised her diverse musical productions which have also been known to induce controversy. Madonna has sold more than 300 million records worldwide and is recognized as the best-selling female recording artist of all time by Guinness World Records. Time considered her to be one of the "25 Most Powerful Women of the Past Century" for being an influential figure in contemporary music. Madonna is the best-selling female rock artist of the 20th century and the second best selling female artist in the United States, with 64.5 million certified albums. Considered by Forbes and other publications as a cultural icon, she is often referred by the international press as the "Queen of Pop". In 2008, Billboard ranked her at number two, behind only The Beatles, on the Billboard Hot 100 All-Time Top Artists, making her the most successful solo artist in the history of the chart. She was also inducted into the Rock and Roll Hall of Fame in the same year. In 2012, she was crowned the "Greatest Woman In Music" by VH1. As of 2013, some sources report that Madonna's net worth has crossed over one billion dollars.